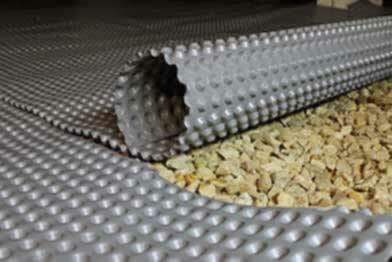 Get an extra layer of moisture drainage and durability with Crawl Space Drainage Matting. Matting has built in dimples that align both vertically and horizontally to rapidly channel water from grade to footer drainage system. The stud shaped dimples provide an air chamber between the roll and its matting surface. Meets/exceeds ICC-AC114: acceptance criteria for rigid, polyethylene, below-grade, damp proofing and wall waterproofing material. Made from recycled content, so it's environmentally friendly too! High-density polyethylene (HDPE) construction provides strong resistance to hydrostatic pressure and excellent drainage. Construction material and dimpled design offer excellent drainage and durability. Meets/exceeds ICC-AC114: Acceptance Criteria for Rigid, Polyethylene, Below-grade, Damp proofing and Wall Waterproofing Material. Re: Your A1050 product. do the seams seal. My project has trickling water. source unknown. Get an extra layer of moisture drainage and durability with Crawl Space Drainage Matting. Matting has built in dimples that align both vertically and horizontally to rapidly channel water from grade to footer drainage system. The stud shaped dimples provide an air chamber between the roll and its matting surface. The product is nice and lite weight but very durable. It comes in a manageable size that one person can move around. It can be cut to size w/ an utility knife to fit the crawl space you are installing it in.